Simbambili Lodge is situated among dense stands of knobthorn and jackalberry trees along the meandering Manyeleti River in the Sabi Sands Game Reserve, part of the world-renowned Kruger National Park. Sophisticated yet simple, each suite has spectacular views over an extensive savannah grassland that teems with wildlife, as seen from the unique en-suite bathrooms and salas or from individual private plunge pools. 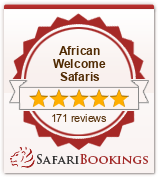 The Sabi Sands is famous for its big five and has the highest concentration of leopard in the world. It offers cat lovers a chance to meet the stars of the Simbambili Leopard Project an online journal of the life of three leopards Saseke (the beautiful one), Mafufenyane (the angry one) and Nyaleti (the star) – face to face in their natural habitat. Tireless attention to detail and the desires of our guests are made possible by limiting this exclusive safari experience to a maximum of twelve. Simbambili Game Lodge offers unique exclusive Safari experiences in both open Land Rovers, and on foot. The private reserve is home to an abundance of species: 147 mammals including the “Big Five”, 114 reptiles, 507 birds, 49 fish, 34 amphibians and 336 trees. The reserve is predominantly open savannah and with a near perfect year round climate, it is the ideal African safari holiday destination. Imagine exchanging your vows in an African Dry River Bed at sunset, the bride being serenaded in by African dancers amidst tribal song…. Few experiences can be as personalized as a wedding and we therefore realize that each experience will require attention to the finest detail. We can promise you unrivalled big game viewing, complemented by exquisite accommodation and sublime cuisine and above all, a day you will never forget. Your safari style wedding will be a celebration of love, tradition and lasting memories. Arrangements can be as glamorous or as understated, according to the bride your wishes. Considerations need to be given to weather conditions and the fact that we are in a nature reserve so certain restrictions do apply. Ministers from most denominations are easily accessible, as are photographers, cakes, hairdressers and florists. Special menus and dining venues can be set aside for the wedding party, when the lodge is booked exclusively. All you need to do is sit back, relax and leave the wedding preparations up to someone else whilst you enjoy massages, sunset cocktails and game drives. Our wedding venues are renowned for their beauty and excellent service. The lodge is a fantastic romantic destinations for honeymooners and your hosts will ensure that it is a romantic and unforgettable experience.